The report is released by the Stockholm International Peace Research Institute (SIPRI). It contains information on all transfers of major conventional weapons from 1950 to the most recent full calendar year. The assessment for the report was done for a five-year period (2014-2018). 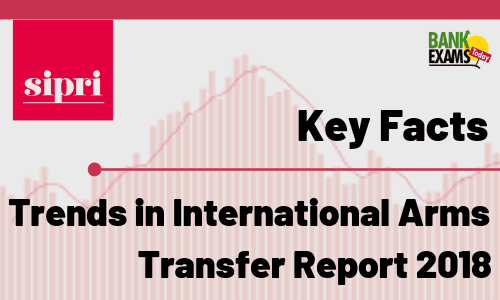 The volume of international transfers of major arms has grown steadily since 2003. In 2014–18 the volume was 7.8 per cent higher than in 2009–13 and 23 per cent higher than in 2004–2008. The five largest exporters in 2014–18 were the United States, Russia, France, Germany and China and together they accounted for 75 % of the total volume of arms exports in 2014–18. US exports accounted for 36 per cent of the global total in 2014–18. US arms exports in 2014–18 grew by 29 per cent compared with 2009–13. Russian arms exports decreased by 17 per cent between 2009–13 and 2014–18. The five largest importers in 2014–18 were Saudi Arabia, India, Egypt, Australia and Algeria which together received 35 per cent of all arms imports. The main recipient region in 2014–18 was Asia and Oceania (accounting for 40 per cent of global imports), followed by the Middle East (35 per cent), Europe (11 per cent), Africa (7.8 per cent) and the Americas (6.2 per cent). Between 2009–13 and 2014–18 arms imports by states in the Middle East increased by 87 per cent. By contrast, overall imports decreased in the Americas (–36 per cent), Europe (–13 per cent), Asia and Oceania (–6.7 per cent) and Africa (–6.5 per cent). The flow of arms to the Middle East increased by 87 per cent between 2009–13 and 2014–18. India was World's second largest importer of major arms in 2014-18 and accounted for 9.5% of the global total. India's imports decreased due to delays in deliveries of arms produced under licence from foreign suppliers.